The XXI Commonwealth Games is going to be held on the Gold Coast, Queensland, Australia from 4th to 15th April, 2018. Some members of the organizing team are travelling to 71 commonwealth countries with a baton with the message from Her Majesty Queen Elizabeth II. 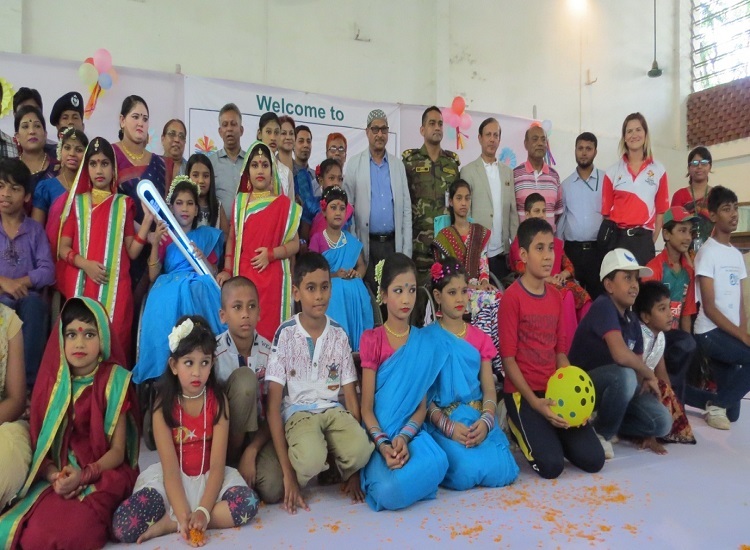 After visiting India, the Queen’s Baton Relay team, led by Carry Thomson, came to Bangladesh on October 9, 2017. The team visited the National Monument at Savar the next day. On their way back to Dhaka, they visited the head office of the Centre for the Rehabilitation of the Paralysed (CRP), which was a great honour for CRP. Children, patients and staff greeted the team with flowers. After a welcome speech by CRP’s Executive Director, Md. Shafiq-ul Islam, a spinal cord injured patient, Mr. Saleh Ahammad, who has participated in several international Games, shared his experiences with the audience. Afterwards, the children of William and Marie Taylor Inclusive School of CRP put on a show in honour of the guests. At the end, the team was given paintings by two disabled persons, Al Amin (mouth painter) and Ruma. After the programme in the Reddaway hall, the guests visited the facilities of CRP and then enjoyed a wheelchair basketball match at the basketball court. Before leaving CRP, they expressed great appreciation and satisfaction with the day’s events.